"..it sounds like the most demonic game of Pac-Man ever conceived." 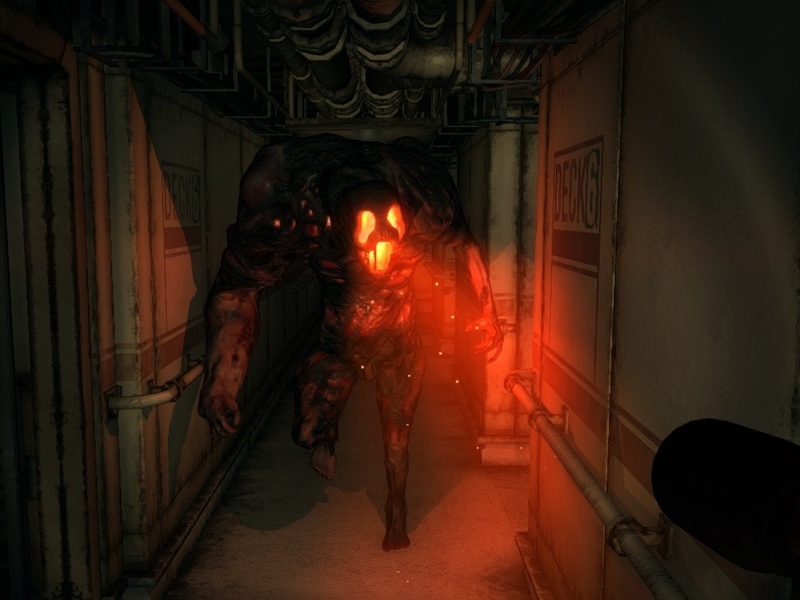 Monstrum is a combination of the Roguelike and Survival Horror genres developed by Team Junkfish. It places the player on a derelict, procedurally generated cargo ship, where they must attempt to find a way off. Seemingly easy... except all the escape routes are missing components to make them work, and standing between you and those components, there are certain... creatures. Advancing Boss of Doom: You have no way to actually harm whichever monster you end up with; you can only evade or lure it elsewhere. note Granted, you can at least stun it via item like the fire-extinguisher, but that still only buys you a couple of seconds at best. Always Close: The ending cutscenes always show you narrowly evading the monster in the vehicle of your choice. Ambiguous Time Period: One of the collectible notes indicates that the ship fell to the monster in 1977, although whether or not that's the year the game takes place isn't established (given that the protagonist's notes state he simply showed up on the ship without explanation). Certainly, you don't find any items or technology that weren't around in 1977, other than the standard video-game automated security cameras (which we don't even have now). A Winner Is You: Beating the game results in a cutscene of you escaping in whatever vehicle you used and narrowly fleeing whatever monster was present at the time. Air-Vent Passageway: One of the monsters, called the Hunter by the developers, primarily uses the vents to get around and ambush the player. Barrier-Busting Blow: The Brute can force its way through anything, including power-locked doors. Big Creepy-Crawlies: The Hunter is meant to evoke this in its design. And holy crap, does it work! The Brute is the most-straightforward monster, being an Almighty Idiot of pure physicality (instead of some complex stalker with fancy abilities, like the Hunter and the Fiend). That being said, the "pure physicality" in question is still enough to make it a terrifying Juggernaut and No-Nonsense Nemesis. The Life Raft ending. While the Helicopter and Submarine ones definitely involve cooler vehicles, the Life Raft one both requires the least steps to complete and doesn't automatically make you play a final Protection Mission against the monster. Red: The Brute's Red Eyes, Take Warning gaze. Green: The Hunter's Bizarre Alien Biology sacs. Blue: The Fiend's Color-Coded Wizardry aura. Complexity Addiction: Unlike the No-Nonsense Nemesis Brute and the Combat Pragmatist Hunter, the Fiend is the most inclined to toy around with you before going for the kill. Arguably justified, though: Its long-range Mind over Matter is something of a Story-Breaker Power. Creepily Long Arms: The Hunter has very long arms combined with Creepy Long Fingers that would be better described as talons that mean it doesn't have to be physically strong to kill you dead. Cutscene Incompetence: All the endings involving the monster ambushing you...and failing utterly. Excuse Plot: You wake up on a ship with no memory of how you got there. There's a monster on the ship with you. Escape. That's the entire extent of the game's plot. Scattered notes found around the ship provide some background flavor (such as establishing the year the ship fell to the monster as 1977, and possibly hinting that the monsters are wildlife or humans that were injected with an experimental healing serum derived from deep sea jellyfish), but don't actually present an over-arcing story. Featureless Protagonist: Being in first person, the player never sees their own face. Even in the game over screens depicting the protagonist, their face is obscured, though they are obviously a light-skinned male. The death screens were removed in the latest version of the game, possibly for this reason. Fighter, Mage, Thief: The three monsters could be seen as operating this way. The Brute is the fighter, extremely fast and extremely strong, but mindless and stupid. The Hunter is the thief. It's physically weak and the player can outrun it, but it can skitter through vents and ambush the player and is described as a cunning predator. The Fiend is the mage. It's the slowest monster in the game with relatively low strength, but is supposedly more intelligent than the player themselves. It also has a wide array of telekinetic abilities and is meant to invoke a feeling of powerlessness. Final Death: Like many roguelikes. Once caught, that file and world is lost forever and the player is forced to start over fresh. The game goes so far as to completely lack any kind of save feature, so your only options are to win or die. Ghost Ship: The game is set on an abandoned cargo ship. The only living things on it are the player character and the monster who is trying to kill you. Glowing Eyes of Doom: The Brute and The Fiend both have these. Hell Is That Noise: The various roars of the monsters. Also the alarms that let said monsters know where you are. Humanoid Abomination: The Fiend is an emaciated gray humanoid with an elongated head, tiny glowing pupils, and telekinetic powers that it uses to freeze the player. It floats through the air due to its legs ending in stumps. The Juggernaut: The Brute plows through any doors in its way during a chase and sprints just as fast as the player character. Jump Scare: When the monsters pop up right in front of you, particularly when the Hunter emerges from a vent or an egg sac. The steam pipes in the Lower Decks also qualify (yes, the steam can kill you!). Luck-Based Mission: The difficulty of a play-through depends heavily on the random spawning of the escape vehicle components, as well as which of the 3 monsters you are assigned to face (the Hunter is generally agreed to be somewhat easier than the Brute or Fiend). The Many Deaths of You: Getting caught by one of the monsters treats you to a first-person death animation of them horribly killing you in some way relative to the manner in which they found you, such as the Hunter pouncing on you and devouring your head or the Fiend violently twisting your limbs with its power. Magma Man: The Brute, combined with Rock Monster. The Mole: The collectible notes reveal that at least two or more passengers or crew on board the ship were part of a secret operation to gather mysterious "specimens" from the Pacific Rim region. It is implied that the specimens may have hatched or matured and become the monsters, though the notes are extremely vague and this may or may not be the case. New notes added in the 2016 patch seem to suggest the specimens were deep sea jellyfish, which were used to create a serum that unwittingly creates the monsters. Multiple Endings: There are three different ways to escape the ship, each with a unique ending cutscene. Additionally, each cutscene varies slightly depending on which monster was hunting you during that playthrough. Neck Snap: The Brute's preferred method of killing you. The Fiend can do this with telekinesis as well. Obvious Beta: Despite being released from Early Access, Monstrum still suffers from a number of bugs, some of which can be gamebreaking . Offscreen Teleportation: The Hunter is another brand of horror because the player can't actually get away from the damn thing. It is using all the vents in the ship to keep up with you, and outright crawls up the side of the ship if you make too much noise on the deck. It'll even pop out of the various eggs it lays, and those can be anywhere onboard. Power Floats: The Fiend's Mind over Matter lets it compensate for its lack of feet. Rock Monster: The Brute is a massive Golem type thing that looks like cooled lava, complete with Glowing Eyes of Doom that can give you a warning that he's nearby  if the stomping doesn't tip you off. Roguelike: While the general layout of the ship and the location of key areas is the same every game, the exact interior rooms and corridors do change from game to game. Your spawn location and the location of items is different in each play-through also. Shout-Out: The ship the game takes place on is named the Hisa Maru, run by a company owned by a Mr. Kobayashi, a shout out to the Kobayashi Maru from Star Trek. The Brute: A hulking, fiery golem. Physically the strongest of the monsters, able to knock down doors when pursuing you. However, it's also by far the noisiest of the monsters, allowing the player to hear it coming, and its Glowing Eyes of Doom creates a red light wherever it looks that warns the player if it's just around the corner. The Hunter: An almost skeletal entity with elongated, clawed fingers. It travels around through the ship's vents, and can scale up walls. It is much quieter than the Brute, and the poor lighting of the ship means that by the time you see it, it may already be too late. The Fiend: A wraith-like demon that levitates instead of walking (it has no feet). It has supernatural powers like shorting out lights whenever he is near and possessing telekinetic abilities. It "plays on more malevolent tropes like serial killers and the supernatural". Oh, and its inclusion to the game was veiled in the patch notes, catching most players by surprise when they encountered it for the first time. Universal Driver's License: The protagonist is able to competently drive both the helicopter and the submarine (vehicles which require an enormous amount of training to operate), and can fly the helicopter well enough to pull off a complex, risky maneuver (scraping the monster off on a passing cargo container while it's hanging off the landing struts). Was Once a Man: The new notes added in the 2016 patch reveal that the Brute and the Fiend were created in medical experiments where two injured "test subjects" were injected with a regenerative serum derived from deep sea jellyfish. The test subjects may or may not have been the two injured crew members that are mentioned repeatedly in the notes and audio logs. You Wake Up on a Ship: The protagonist seems shocked to be on the ship, and doesn't know how they got there. That said, it's not really the driving question, seeing as your main priority is to get off the ship to, y'know, escape the abominations chasing you. It's left vague as to whether the protagonist is one of the 2 crewmen who are mentioned in the notes as having been unconscious during the initial attack due to earlier injuries, and has amnesia, or if they're an entirely random stranger who has been transported to the ship by unknown means. Neither possibility is ruled out by the game.